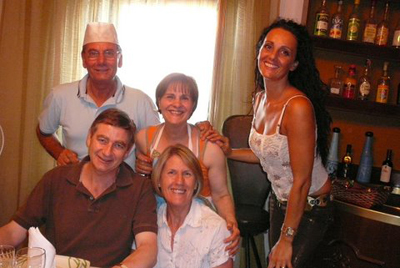 My entire family remembers the wonderful tour of Sicily that you gave us! 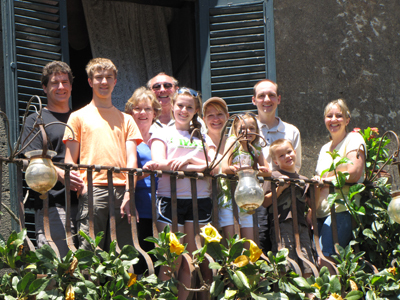 Our time on Sicily remains, to this day, a HUGE highlight of our vacation! We finished our honey and flavored olive oil that we purchased from the nice little store you took us to, and we will forever remember the special tour of the Godfather House and the chance to meet the Baron! Not to mention the beautiful town of Taormina, and the delicious gelato! I will definitely recommend your services to anyone who I know is going to visit Italy! 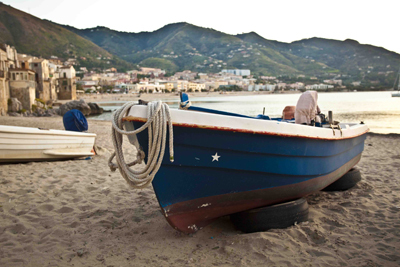 And, you never know…maybe we will get to return to Sicily again someday! I know I would love that! Dear Angela; Thank you and your husband and parents again for a truly exceptional and wonderful experience. 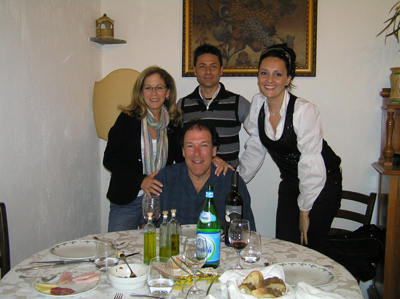 I came home with a very strong affection for Sicily and your family. We hope to come back soon to see what we missed. I've been married to Janet for almost 40 years. When we first were married, I used to read aloud to her. Somehow as life went on, we got out of that habit. In Sicily, we rediscovered it and I've been reading Montalbano mysteries to Jan every night to help her get to sleep. Some day I want to see the sea from Montalbano's veranda. Four days in Sicily. 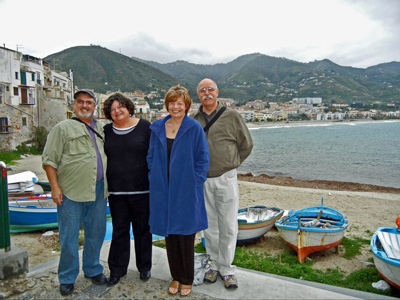 We had a private guide and driver for Jan and me and our friends the Wells, Angela Macalusa, and her company Fransicile. I cannot say enough about Angela's expert guidance and the great enjoyment we had of her company and that of her husband and family. Anyone seeking a private tour of any and all parts of Sicily should email Angela at isdepa@tiscal.it or angela@fransicile.it. She also guides private tours of the Amalfi Coast. We are already planning to return to Sicily for her to guide us to the other half of Sicily we did not see. I want to take her "Montalbano Tour," of Ragusa and surrounding areas, including Agrigento, which are the locations where the Italian TV series based on the Camileri mysteries are filmed. She can get me into Montalbano's house in fictional Marinella. The Inspector's HQ is fictional Vigata, which is Ragusa. His fictional Montelusa is Agrigento. I recommend anyone who is interested in Sicily to read Camileri first before visiting. One learns the meaning of what one sees, as well as a wonderful guide to the exceptional gastronomy of Sicily. Angela is an expert on all these things and we were so very fortunate to have her guidance. She helped me get my baggage sorted out at the airport in Catania for our flight to Malta, even talking the officials into letting me jump the security line. Wasn't sure the looks we got were daggers or folks wondering just who the hell we were to pull such a stunt. Angela took very good care of us indeed. Gary and I want to thank you so much for planning and 'taking' us on such a great trip!! We really enjoyed it so much, and had a lot of fun spending time with you and Micheala! And your parents too!! I truly hope that you come to NY and we can plan the cooking classes..or anything else! I also want to know how you are feeling? Have you gone for further testing? I hope you're feeling better..if you can, please let me know what the doctor says. Regards to Micheala and your parents!! 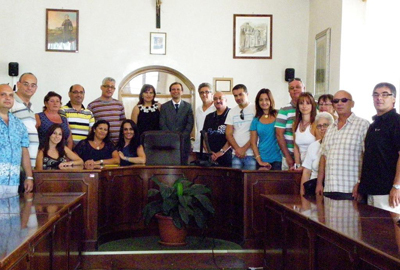 We write to express our profound gratitude and appreciation for the way you handled our case this past Tuesday in Cefalu. The professionalism and devotion demonstrated by you; your good advice and the contacts you have created for us have all greatly contributed to the success of our trip in Eastern Sicilia. If you ever come to the Holly Land, please make sure that you contact us. We shall be delighted to host you and to do our utmost so as to make your stay in our country an enjoyable and enriching experience.Also, we understand that your agency concentrates on in-coming tourism operations. Israel is a fairly small country (7 million people), but the Israelis are well-known for being avid travelers. So if you decide that it suits your plans to establish contracts in the tourism industry of our country, we shall be delighted to assist you, to the best of our abilities, in making the necessary contacts. Thanks again for the wonderful day, trip to the Valley of the Temples, dinner at the Chamber of Commerce overlooking the Valley, and everything else we did. You were truly amazing. I would like to post an entry on your website. (I would also like to have everyone who was on our trip to do the same, and I hope they will.) Where on the website do I go to post an entry? (I see where the comments are posted, but not where to add comments.) Also, there are a few photos which I am asking the person who was taking most of the pictures to send to you. Dear Angela, We have been home for five whole weeks now, and our wonderful holiday seems so long ago. Life at home has overtaken our good intentions, so the attached photographs are rather late. They are not spectacular, but for us they are lovely mementoes. We really enjoyed Sicily. So much to see and we particularly appreciated visiting with your parents for a great local touch. It has been a month since we returned from our Mediterranean Cruise. 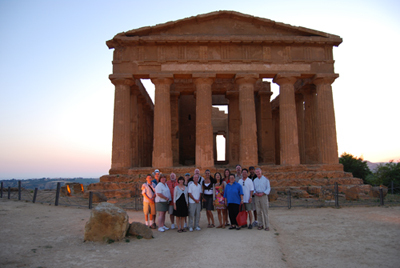 Of the 8 cities that we visited in Italy, Spain, France, and Monaco, I have to say that our family’s favorite was Sicily! All the Thanks go to you!!! 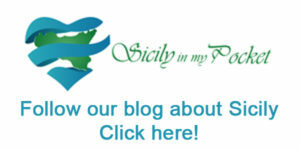 Thank you for recommending such wonderful sites to see during the limited time we had to spend on Sicily! Your recommendations were a huge hit with not only Rob & myself, but our teenagers, Brandon & Brittany, and the rest of my family! I could tell that the kids’ eyes and ears perked up when we stopped at the place that explained the production of honey in Italian, and they were eager for your interpretation into English. We all enjoyed tasting the varieties of honey, as well as the different yummy Olive Oils that they made. The villages we went through to get to the crater on Mt. Edna were neat to see as well! Seeing the recent lava that once flowed from the volcano was as interesting as the beautiful view from the crater! And, I have to say we were the luckiest travelers that day to get the opportunity to tour the house where The Godfather movies were made! I believe having our picture taken on the balcony where Al Pacino once stood was a crowd favorite! As if that weren’t enough to pack into our few hours on Sicily, riding the sky lift up to the quaint & picturesque town of Taormina was a real treat; not to mention the yummy Gelato!